Ferrets really are the best pet! Here at Marshall, if there is one thing we know, it is ferrets. We have been the largest breeder and exporter of the world’s friendliest ferrets since 1939. Over the years we have seen the popularity of ferrets grow to become the third most popular pet in America, after dogs and cats. Ferrets are an incredibly social animal and will quickly become part of your family. They will dook (dance and sing) their way into your hearts and become part of your daily routines, to the point where it will be hard to imagine your family without them. They have an insatiable energy and need to connect often. Getting ferrets as babies (called kits) is similar to getting a kitten. While they sleep up to 18 hours each day, their short spurts of energy require social interaction to keep them happy and properly exercised. Having a spot in the house that is dedicated for playtime is recommended so the area can be properly ferret-proofed to keep them safe. If your ferret is free-roaming, you can be certain that your side kick will hang around and fall asleep in your lap when they are tired. This is why many people adopt ferrets in pairs. They will have a companion to play with while their owner is away and will keep them from getting into trouble. The ferret community calls this ferret math and many owners end up with a business of 5 or more and question how it got to this number. Those owners will tell you they are happier because of ferret math! Ferrets are easily trained. That’s right… ferrets were one of the hardest working animals in the early 20th century. During this time, they were trained to help rid NYC of rat infestations, and Boeing also used them to run wires through tight machinery. This means getting them to use a litter box is a challenge that is usually quickly taught, and doing tricks to please will become routine. 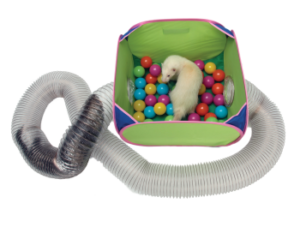 The Marshall Premium Ferret Litter provides excellent odor control. The recycled newspaper pellets are dust-free, biodegradable and flushable! Using this with one of our High Back Litter Pans makes it easy to get your ferret litter trained. One of the benefits of adopting kits is that you are able to make the impressions necessary on the young pet to help them quickly feel comfortable in their family home and promote healthy habits in their diet, hygiene and behavior. They do have baby teeth and may get nippy. While this stage has given ferrets a bad rap, it is typically short lived because ferrets are so easily trained, and bad habits can be quick to break with consistent discipline. Ferrets don’t take up a lot of space. You may hear the opposite from some ferret fanatics, but the truth is the cages should take up very little space. While they are not in their cages, it is encouraged that they play in a ferret proofed space. Having a spot with a couple of Super Thru Ways and a Pop N Play Ball Pit is fun for the ferrets to play and the family to watch. Some people dedicate entire rooms in their home to their free-roaming pet, but this is not necessary. All they really need are some warm places to burrow and sleep like one of the Marshall Banana Hammocks or the Sleep Sack and a place to do their business. That is why ferrets have become a popular pet for those that live in small spaces like an apartment. Ferrets are funny and have relatable personalities. Just as dogs and cats have their own individual personalities, so do ferrets. They will each evolve to connect with members of your family and personality traits will begin to emerge. When they play with each other, they get excited and will often give you a little song and dance (called dooking). They tend to steal things from you and hide them in their own special spots (one of the reasons why the most popular ferret name is Bandit) and they will show you their love in their own special way that only you two will understand. Some will kiss you on the chin and others will curl up on your neck. Either way, the bond you create with a ferret is one based in love, trust and loyalty. Is a ferret right for your family? As with any pet, there are things you should be aware of when considering a ferret for your family. A ferret is a responsibility. We encourage people to do their research to fully understand the care that is needed for a ferret. Yes, it is a great way for an older child to learn responsibility of a pet without having to take it for walks to do their business; The family should also know this is in no way a rabbit or hamster. Ferrets need social interaction, daily cleaning of their living space, and exercise out of their cages. You should also have a vet that is familiar with the care of a ferret. While a ferret is in no way exotic, they are considered as such in the veterinary field. Find a vet that knows your pet. Providing the proper diet for a ferret is integral to the overall health and life span of your pet. Be prepared to purchase the proper diet without taking short cuts for a value priced product. 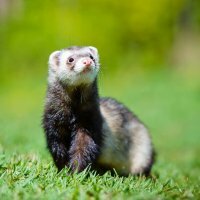 Every Marshall ferret comes with a one-year guarantee, provided you maintain feeding the diet they are given on the farm, the Marshall Premium Ferret Diet. This diet is specially formulated by vets, nutritionists and ferret experts for the ferret’s high protein nutritional needs and short digestive track. 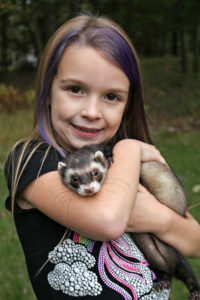 And while a ferret is social and friendly, you should always supervise interactions with other pets and small children. And what about their smell? This is a common complaint of many small pet owners. Their smell comes from their high protein diet. All Marshall ferrets are de-scented before they leave the farm. While this goes a long way to subdue the smell, the all-natural supplement Good Bye Odor further works to combat that smell from the inside. Maintaining a healthy diet, and a clean cage will significantly reduce the offensive smell that ferrets are known for. 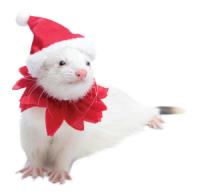 Today, National Ferret Day, we here at Marshall want to thank all of the ferret parents out there who are taking such good care of our furry friends. We appreciate their dedication to their pet, their support of the ferret community and their ferret love. For many of us, our ferrets are family members, and there’s nothing we wouldn’t do for them. 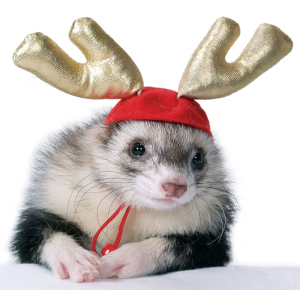 Whether you are shopping for your ferret or a family member with a ferret, you can’t go wrong with any of our top ten gifts for ferrets. They’re also perfect for holidays, birthdays and any other gift giving occasion! Deck out the fuzzies in festive Holiday Antlers and let them join in the reindeer games this season. Perfect for ferrets and small pets, your fuzzy will stay cozy in this multi-function Bear Rug. They can nap inside or play a game of hide-n-seek on this plush rug. A classic Santa Hat and collar will make it the best time of year this Christmas. It includes a collar and separate hat with elastic strap. This handy backpack serves two purposes; toting your pet and carrying your pet’s supplies. The main compartment is vented for optimal airflow. 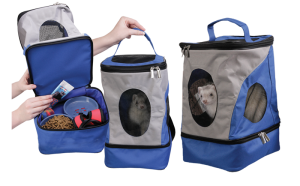 Zippered storage compartment holds pet’s food, waste bags, lead, and toys. 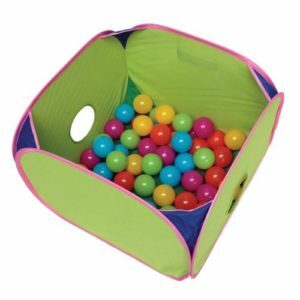 Your ferret will love jumping in and out of holes and tunneling through colorful balls in this Ball Pit. Excellent for multiple ferrets and other small pets such as guinea pigs, rats, and chinchillas. Pair with our Super Thru-Way Tunnel for added fun. We asked our fans to give us their number one reason to have a ferret for a pet, and we received over one-hundred answers. If you’ve ever wondered how it feels to have a ferret as part of your pet family, read below. Chances are you spoil your ferret with extra love every day, so we thought we would take this opportunity to create a checklist to keep your ferret happy and healthy. You’ll need at least one of each when you take your ferret home. • Extreme Freeze Dried Treats. Marshall Salmon Chunks and Munchy Minnow are made with fresh whole animal protein to provide essential nutrition that every ferret wants. Keep them clean and smelling fresh! • Daily Spritz. Keep them clean in between shampoos! This is certainly not a complete list, but it will give you an idea on what items to keep in stock.